Solutions for moving your mineral tubs (while spreading manure), and creating a fence for your water gap, as well as a stand for your solar charger. Dan Divine, a former NRCS agent based in Wright County Missouri, was telling me about his water gap and mineral feeder ideas a couple days ago and I asked him to send some photos. Dan has always been a strong grass farming proponent and Wright County was lucky to have an agent who practiced what he preached. 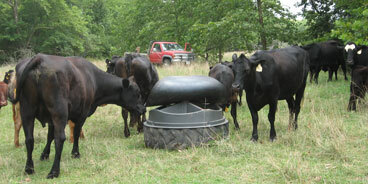 The mineral feeder was purchased from Fisher Feed and Farm Supply and has three compartments, allowing different minerals to be fed, all protected by a rubber cover. The only problem, as anyone who frequently moves their cattle knows, is moving these kind of feeders without a truck or tractor is a pain. 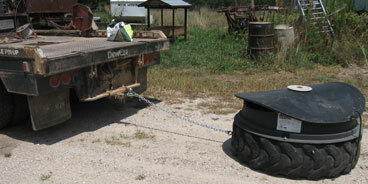 Dan came up with a way to move them with his ATV by bolting them to a loader tire and attaching a bolt with a round head to attach a chain and pull the feeder. It also has the added benefit of spreading out the manure while you move your feeder. Dan ties back the cover the first few days to allow the cattle to learn where the mineral is before letting them raise the cover themselves. I’ve seen this variation of a water gap before, but Dan has added his own twists to the process. 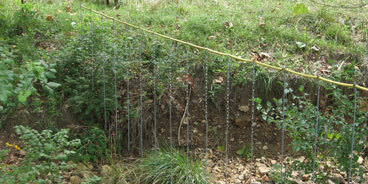 The basic idea is to stretch your wire across the gap well above the high water mark. Then attach light chain, weighted at the bottom, to the wire and electrify the whole thing. When the water rises you can turn off the power to the water gap and the chains just dangle in the water hopefully not catching any debris when the creek or river gets high. Dan cut old hose to make spacers for the chain attached to the top wire. 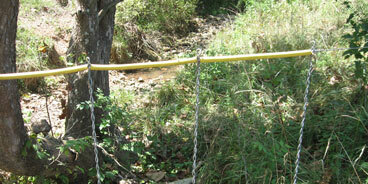 He also used snaps to attach the wire and attached some old twist wire stays to extend the chain. Chain isn’t cheap and the stays work well. One of these gaps is 100 feet wide and has been in place about four years. At the Linneus Field Day I met a father and son contract fence building crew, Mike and Jeff Frieze. 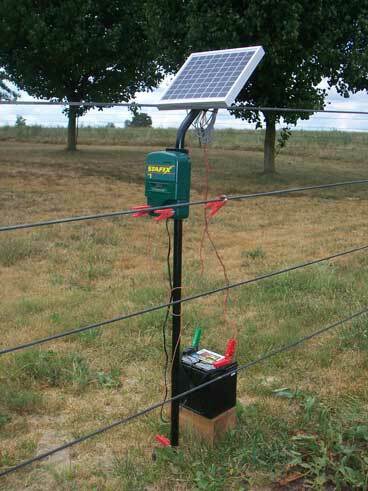 Mike and Jeff have also started a new electric fence company, MSF fence, that builds creative components for grazers. I really liked the stand they fabricated for solar chargers. Not only does it hold your charger and panel, but they use a separate foot that anchors the stand and doubles as the ground rod for the charger. You can also buy extra feet, so if you use the charger in other fields all you have to do is slip the stand off the foot, disconnect your battery and carry the whole stand, charger and panel included to the new field. Pretty nifty. Nice ideas! I’m going to try that water gap where a cottonwood snag blasted a cross-creek fence; the intergenerational wreckage of pole, board and barbed wire fence there suggests it’s time to adjust the strategy.